The Clan Chisholm Society was founded at the end of the 19th Century by Chief James Chisholm, and revitalized in 1951 by his granddaughter, Mairi and her nephew, Chief Alastair. Today, Alastair's son, Andrew Francis Hamish Chisholm of Chisholm is 33rd Chief of Clan Chisholm, and Juliette Chisholm Broomfield is President of the Clan Chisholm Society. The mission of The Clan Chisholm Society is to preserve the heritage of our Scottish clan and to promote links between Chisholms around the world. 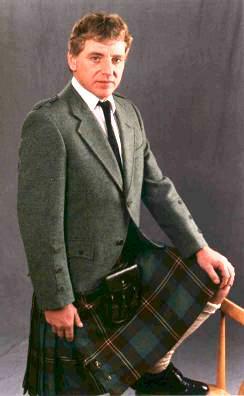 Hamish was born on 28th September 1956 at Ottershaw in Surrey, the son of Alastair, 32nd Chief and his wife Rosemary. He was raised at Silver Willows Farm, Beck Row in Suffolk with his four younger sisters, Susan, Theresa, Claire and Lucy. Family holidays were always taken in Glen Cannich and the Strathglass area. Mullardoch and Glen Affric became very familiar territories to the growing family. Hamish was educated at St. Benedict's in Bury St. Edmunds where he proved to be as athletically gifted as his father had been. He held the high-jump record, which stood for several years after he left the school. He then attended Chadacre Agricultural Institute before going into farming. Hamish later gained business qualifications and now runs his own haulage firm from a small farm near Beck Row. In 1978, Hamish married Julie Greenacre. They have three children, Andrew, Katrina, and Anna. Andrew has left school, and with Julie, helps to run a skip-hire business also from Elmpine Farm. Three of Hamish's four sisters live and work nearby in Suffolk, whilst the fourth, Lucy, lives in south-west Ireland. Both Hamish and Julie are active in the local community and lead very busy social and business lives. The family hopes to spend more time in Scotland in the future. They are very keen to start renovating a small property that Hamish now owns in Strathglass. This they plan will be used once again for family holidays and as a base for exploring the old Chisholm lands. Hamish very much looks forward to a fuller involvement in the Clan Chisholm Society and to meeting his fellow clansfolk at the Society's International Clan Chisholm Gatherings.